Little boy and Dad meet horse. Photo credit: Joan Deutsch. By Shannon Hays, Snohomish County Parks, Recreation & Tourism. 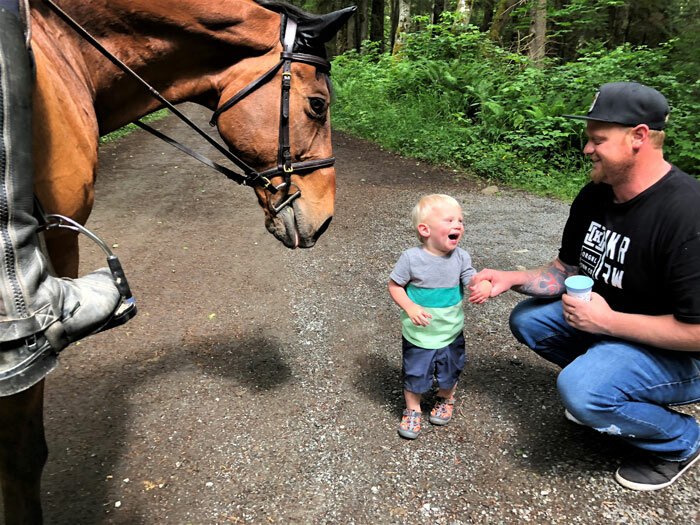 Snohomish County Parks, Recreation & Tourism completed an open, online public equestrian survey titled “Horses Count” asking about equestrian needs and interests in County Parks and Trails. The results from the survey are intended to be one component in helping guide long term equestrian park and trail planning with how and where to better serve equestrian needs in Snohomish County. The County received almost 1,500 responses to Horses Count that ran from May to July 31, 2018. Over 1,000 responders had Snohomish County zip codes with the highest number of responses from 98290. Large numbers of participants also included the 98223 and 98272 zip codes. The survey did not allow participants to take it multiple times ensuring unique individual responses. Key findings from the survey included high interest in seeing more back country, natural surface trail riding with over 80% of participants expressing interest and long distance trail riding (ie: Centennial Trail) with over 54% interest. Over 75% of participants would like to see continued improvements to trailhead parking with many interested in including round pens that can allow horses to easily transition from being hauled to riding the trail. The majority of participants stated they hauled their horses to ride. Another interesting finding included the desire for more equestrian camping options at over 70% of participants wanting to see this type of recreation. The survey results also indicated interest for covered arenas, competition facilities and outdoor uncovered arenas but to a somewhat lesser extent than trails, parking, and equestrian camping. Overall Horses Count confirmed Snohomish County’s strong interest in equestrian recreation and reiterated The Park and Recreation Element of Snohomish County’s Compressive Plan identifying equestrian recreation as a priority. The survey results helped to identify key areas to consider as Parks plans out the next several years of improvements and new developments. “We value Snohomish County’s equestrian community and thank those who took part in the survey,” said Snohomish County Executive Dave Somers.